Sorrel & Chervil Stracciatella – Dig Delve – An online magazine about gardens, landscape, growing & making. Once again it’s that time of the year when the vegetable garden is providing slim pickings. The purple sprouting and kales are over, and the last of the stored potatoes have gone soft and started to sprout. While we wait for the broad beans, peas and lettuces to start producing we are left with the last of the gnarly roots – which were dug and stored in the barn three weeks ago – and a handful of leeks that were lifted to make way for another crop and are now standing in a trench in a neighbouring bed, looking rather lonely. When the vegetable beds look this barren the plants that are performing well are thrown into sharp relief, and guide us to what we should be eating. The herbs appear first, many of them starting in earnest while it was still cold in early April. The parsley woke from its winter slumber to throw out lush branches of new leaf, while alongside it the chervil followed suit. This delicate umbellifer has a gentle aniseed flavour, similar to yet less pronounced than tarragon. I use it generously in salads, with new potatoes or to flavour a simple herb omelette. Like tarragon it works well with chicken and fish. However, its mild flavour is impaired by cooking, so it should always be added at the last moment to hot food. I keep us in regular supply by successional sowing every three weeks through the summer, always sowing more seed than needed since, like parsley, it can be shy to germinate. In the hedgerows its wild cousin, cow parsley (Anthriscus sylvestris), is also just coming up to flower. 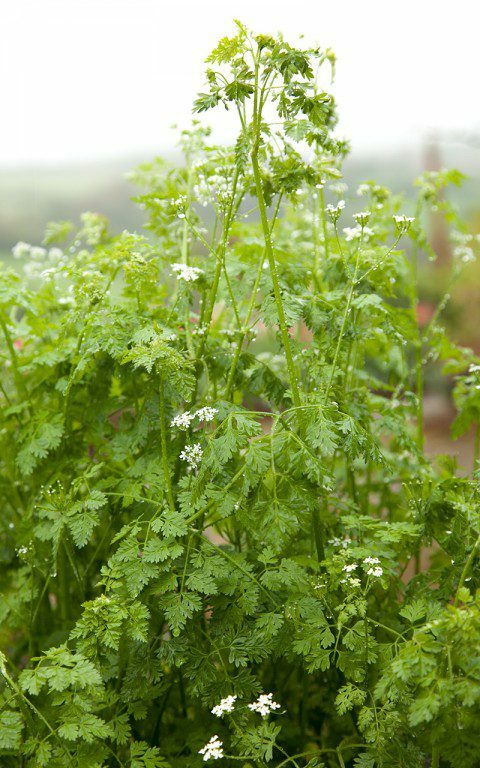 The flavour of wild chervil is slightly coarser, but makes a good foraged substitute. However, as with all foraged umbellifers you must be absolutely sure you are collecting the correct species, as many of them are highly toxic. Use a good field guide if you lack the confidence of a positive identification. 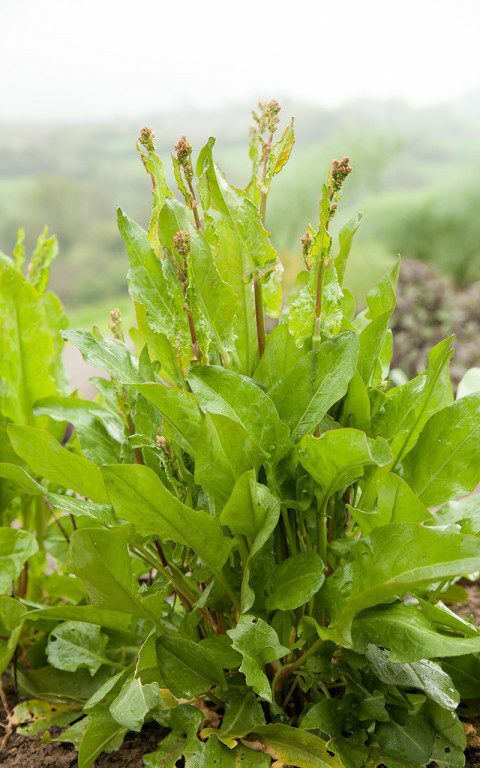 At the same time as the common sorrel (Rumex acetosa) appeared in the fields around us, the sorrel in the herb garden started shooting in earnest and is now producing far more than we can eat in salad alone. Garden sorrel is a cultivated form of the wild plant selected for larger, softer leaves and its sharp, lemon freshness is good with so many things at this time of the year. Like chervil it also works well with chicken, fish and eggs while, on its own it makes a clean, refreshing soup to awaken the winter palate. Sorrel is a hardy perennial and easy to grow from seed, but it also seeds prolifically, so when harvesting you should cut out the flowering stems or, if you have more than one plant as we do, cut them to the ground on rotation. They come back remarkably quickly. Stracciatella is a traditional Roman soup served at the start of festive meals, particularly at Easter. When I was first working in London on a graduate’s wages I would eat bowlfuls of it at Pollo Bar, one of the many great Italian restaurants that Soho used to boast. Despite being nothing more than a bowl of stock with added egg, it was hot and filling and felt like it was good for you for the price. The proverbial meal in a bowl. Although normally made with meat stock – chicken, pork, beef and veal are all used in Italy – I wanted to make a vegetable stock with our surfeit of root vegetables and leeks. Since the success of stracciatella is entirely dependent on the quality of the stock, which must be well-flavoured and complex, the vegetables were roasted before being simmered in water with fresh herbs and seasoning. Parmesan rind adds depth and savour to the vegetable broth. I keep a container of the rinds in the freezer for just this purpose. Made from the last of the winter stores and the freshest of the new season herbs, a steaming bowl of this soup warms the soul as the heavy, cold rain falls once again outside the window. To make the stock scrub all of the root vegetables well. There is no need to peel them unless they are really gnarly. Remove the leaves and any damaged parts and cut into medium dice. If using onion remove the dirty outer papery skin, but leave the rest of the skin on as this adds colour to the stock. Cut into eighths. Put all of the vegetables and the unpeeled garlic clove into a shallow roasting tin and drizzle over a couple of tablespoons of olive oil. Using your hands, mix the vegetables with the oil until well coated. Put into the oven and roast for 40 to 60 minutes. Stir the vegetables from time to time and remove from the oven when lightly browned and starting to caramelise. Put the vegetables into a lidded saucepan with the water, herbs, peppercorns, Parmesan rind and chili flakes. If you are using leek in place of onion, trim off the roots, remove the tough outer layers, chop coarsely and add to the pot. Put the lid on and place on a high heat until it comes to the boil. Turn the heat down low and simmer gently for 30 minutes. Strain through a muslin-lined sieve, then pour back into the cleaned saucepan. You should have about 1.75 litres of liquid. Top up with hot water, if necessary. Season generously with salt. Put over a low heat and bring back to a gentle simmer. Strip the sorrel leaves from the stalks. Bundle and roll the leaves together. Using a very sharp knife, cut into the thinnest ribbons possible. Remove the leaves from the chervil and reserve. Warm the soup bowls. Brush each side of the sourdough bread with olive oil and toast under a hot grill until lightly charred. Break the eggs into a jug. Add the grated Parmesan, black pepper and nutmeg and whisk thoroughly. Take the pan of stock off the heat. With the jug of beaten egg in one hand stir the stock briskly in one direction with the other so that it swirls around the pan, then slowly pour the egg into it in a trickle. The egg will cook on contact with the hot stock and form threads. 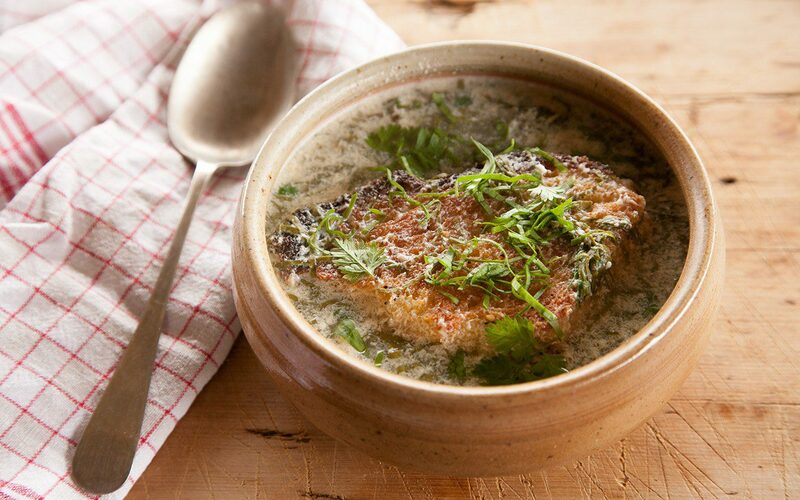 Place a piece of toasted sourdough in the bottom of each soup bowls. Divide the sorrel and chervil equally between each bowl and immediately ladle over the hot soup. The sorrel will immediately turn khaki, but it will still taste delicious. Scatter some reserved sorrel and chervil on top. Serve with additional grated Parmesan and olive oil if desired.